This month, we're determined to help you catch more z's. We've partnered with Equinox to build a sleep challenge guaranteed to help you feel more well-rested by October's end. Each week, we'll tackle one science-backed strategy to help you work toward getting more quality sleep. 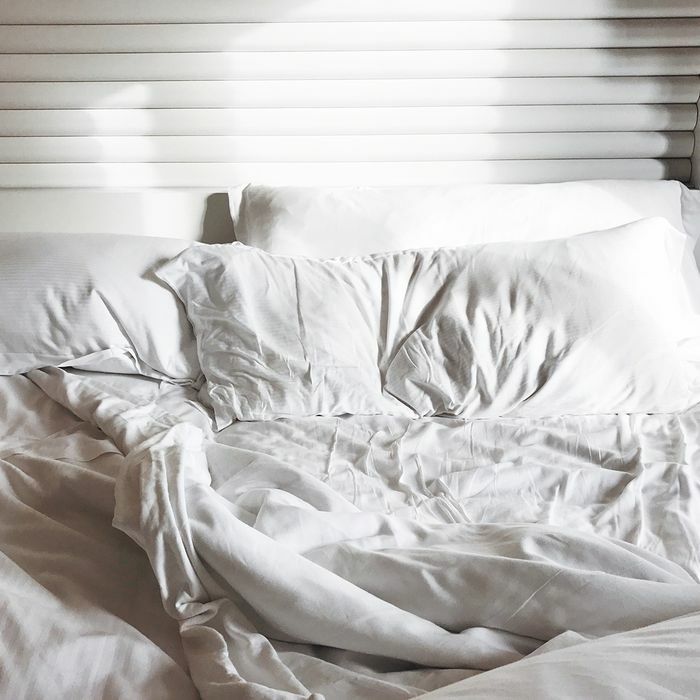 This week, we're talking about simple, expert-backed ways you can unwind and de-stress before bed. I love the idea of a luxurious nighttime routine replete with turmeric lattes and long bubble baths. But until very recently, when I came home from a day's worth of adult responsibilities, little seemed more appealing than parking myself on the couch with reheated leftovers in one hand and my Instagram feed in another. I knew, of course, that this sorry excuse for a bedtime routine was probably not helping my chronic insomnia. But in the moment, shifting my mindset about winding down always seemed like a task better reserved for another night. It was thus unsurprising that during my 12-week sleep training program with Equinox, my coach, Ken Laing, insisted that tackling these vices head-on would be integral to getting a better night's sleep. Over the course of the summer, we worked slowly to phase out patterns like checking my inbox at 11:30 p.m. and falling asleep to Friends reruns, replacing them with habits that would support a much healthier sleep hygiene. While I'd be lying if I said that Netflix is no longer a part of my regular routine, setting aside time after getting my TV fix to de-stress and check in with myself really has made all the difference. It's a testament to the fact that none of the measures I've taken over the past few months to improve my sleep are drastic or even all that challenging. On the contrary, they're subtle shifts with major output. To that end, find three simple, expert-back tips that can help you de-stress before bed below. You've heard it before, but it bears repeating: Setting aside time for a screen-free bedtime routine makes all the difference in clocking quality shut-eye. That means giving yourself a cutoff time—ideally an hour before bed—for all your devices. "Many people will stay connected to things that stimulate them such as work emails or stimulating TV shows or social media until they want to go to sleep," says Laing. "You have to plan time to disconnect." How you use that time is up to you, whether it's reading, relaxing in the tub, or taking other tech-free actions to relieve stress (more on that in a minute). If work tends to keep you up, set a designated time to step away from your inbox each day while also acknowledging that this is merely a goal. "Try to stick to it, but be aware that there will be times when you go past that time," says Laing. "If you can disconnect at a specific time two days per week this month, can you do three days per week next month? The specifics will vary from person to person, but the key is to find something small that you can do consistently." If your mind continues to race when you step away from your inbox, take out a notebook and pen. "Write down things as they come to mind," says Laing. "Put them on paper so you do not have to remember them." When Laing encouraged me to try this compartmentalization exercise during my sleep training, I was admittedly skeptical. Even as a proponent of journaling, writing down my mental to-do list seemed almost too simple to actually work. But sure enough, it was cathartic enough to quiet the incessant chatter that always seems to crescendo immediately after I close my eyes. It made me realize that a lot of my stress stemmed from trying to remember everything I needed to get done, and quickly writing it all down eliminated that worry. Once you've cleared your mind, it's crucial to address any other places your stress might be hiding—and that might be anywhere from your neck to your hips. This isn't yoga speak but science: Emotion is a physiological beast, and research tells us that it can show up via muscle tension, headaches, and even hormone imbalances. If you're not entirely sure where to begin, start with a body scan: Lie on your back, close your eyes, and imagine a light slowly moving up your body from your toes to the top of your head. As the light "scans" each part of your body, make an effort to relax that area, taking note of the spots that are tenser than others. This mind-body connection works both ways, so keep that notebook handy. As you stretch, notice anything that crosses your mind as you work on each part of your body and write anything significant down. "This is the time to work through those thoughts, not after lights out when you are trying to sleep," says Laing. "Create space for that time." Next up: six essential oils that will make you fall asleep in five minutes flat.